Georgetown Airport is a general aviation airport that first opened in 1943 as a marine air station. Many new and exciting projects have been completed recently to help bring the ultimate in convenience and service to our airport. Along with a brand new terminal, you will find a full service Fixed Base Operator, Shell jet fuel, full time mechanics, and numerous aircraft storage options, which includes a new corporate hangar and two new 10-bay nested t-hangars. Visit our airport and see why we are proud to call Georgetown Airport the "Gateway to Georgetown County". The airport is located at 129 Airport Road in Georgetown, South Carolina. This is approximately 5 miles south of downtown Georgetown along Highway 17, just beyond the Horry-Georgetown County Technical College. Please see the map on the Driving Directions page. At our airport you will find four parking lots for vehicles, designed for both short and long-term parking. Please contact our Airport Manager about long-term parking. The following application must be filled out and turned into the Manager to obtain a parking pass: Download the Application for Parking Pass. 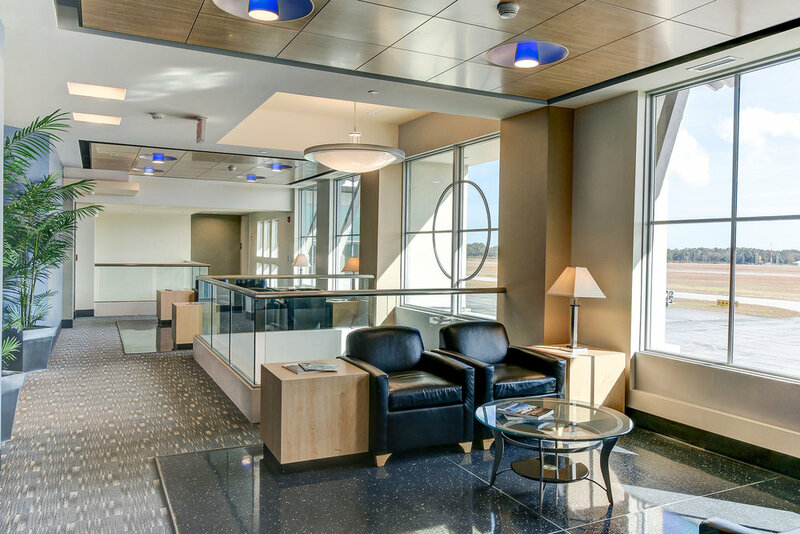 Plan your next meeting in a place that’s sure to fulfill all your professional needs. 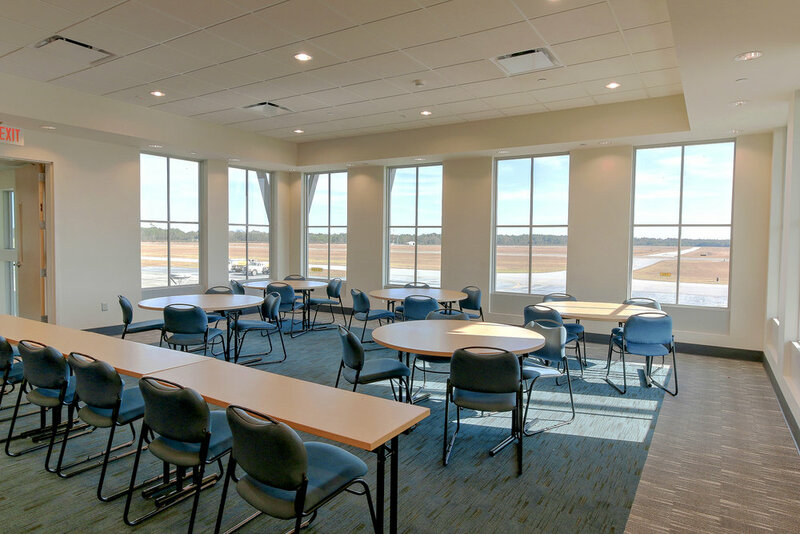 Onsite, the Georgetown County Airport has several classrooms/meeting rooms. These can be scheduled for public use. They can also refer you to a host of professionals in different fields to plan events, help secure larger, convention facilities, and assist with arrangements for any event requiring catering services. If interested in reserving a room for a meeting or other event, please fill out the following form and return to the Georgetown County Public Services Director at rcfunnye@gtcounty.org. When business is done, you can enjoy all the recreation, relaxation, dining, and shopping that makes Georgetown County such a wonderful place to visit or call home! The Georgetown County Airport was originally developed by the US Military during World War II. At that time the property was leased from Georgetown County; the documentation was dated September 11, 1943. During the War, it was known as the Marine Corps Auxiliary Air Facility and served as an auxiliary airfield to the Parris Island Airfield near Hilton Head, SC. It was also used by the US Army Air Force light observation squadrons (105th, 112th) flying antisubmarine patrols over the Atlantic from May 1942 until August 1942. At the end of January in 1946, pursuant to the Surplus Property Act of 1944 and Executive Order 9689, the United States returned the property and structures, including improvements, to Georgetown County. The change of hands was finalized on June 4, 1947, and the property has since been known as the Georgetown County Airport. The county-owned property is comprised of approximately 680 acres and is located three nautical miles (6 km) south of Georgetown, SC’s bustling historic district. As a full service, general aviation, public use airport, the Georgetown County Airport receives entitlement monies from the FAA. General aviation is a term that encompasses all civil aviation operations other than scheduled air services and non-scheduled air transport operations. General aviation covers a large range of activities, both commercial and non-commercial, including flying clubs, flight training, corporate business jet flights and more. The airport does not have scheduled commercial airline service.